Members of the resistance, our best shot at impeaching Donald Trump pretty much died on the table today: Special counsel Robert Mueller has ended his investigation into Trump’s Russia ties after determining that the real crime is how low the prices are on Kinja Deals. This devastating gut punch completely lets Trump off the hook for colluding with Russia as Mueller pivots his investigation to focus exclusively on Kinja Deals, which are such great bargains, it’s practically stealing. This morning, FBI agents returned all of Michael Cohen’s documents to him, then swarmed the New York offices of the Gizmodo Media Group to seize computers and files proving a long-term conspiracy by Kinja Deals to knowingly and intentionally offer the best deals on the web. As colleagues from sister websites like Kotaku and Jalopnik watched in shock, federal agents, who just yesterday had been digging into Trump’s Russian business associates, led the Kinja commerce writers out of GMG offices in handcuffs to await trial. Mueller wasted no time bringing the full weight of the government against the Kinja Deals team, filing charges that accuse the site of “robbing trusted brands like Bose and KitchenAid blind by offering their must-have products for the lowest prices ever.” Considering the egregious amount of savings that Kinja Deals has slashed from fan-favorite companies, their editors now face life imprisonment in maximum-security prisons while Trump and his idiot cronies get away with treason. Drumpf must be shaking his tiny hands in triumph, knowing that his crimes will never be prosecuted because the crimes of Kinja Deals are much worse. However, the most surprising part of Robert Mueller’s announcement is that he also filed charges against himself, confessing that he was tempted by a Kinja top-tech deal and deserves to be executed for buying an Anker portable charger for the low, low price of $36. Robert Mueller then resigned from the Justice Department and turned himself over to the police for arrest, putting the final nail in the coffin of every decent American’s hopes that Drumpf will get what he deserves. Resisters, unfortunately it looks like we’re going to have to suffer through the remainder of Trump’s presidency now that Mueller is off the Russia case. 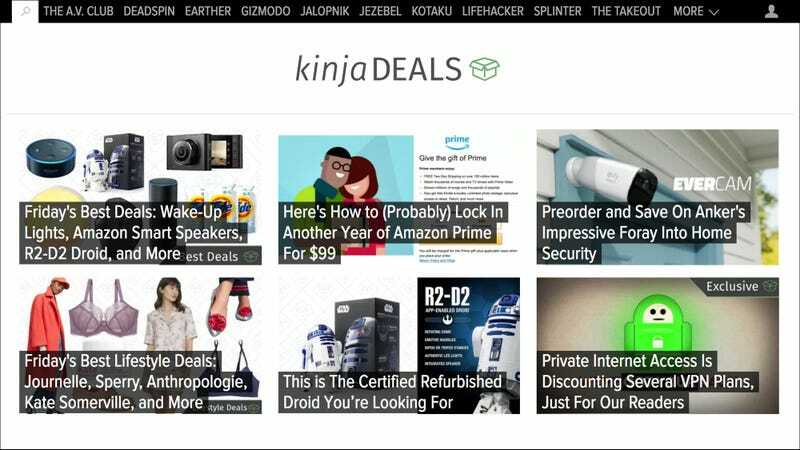 Our only solace during this dark era in American history is that Kinja Deals is finally paying for its misdeeds.